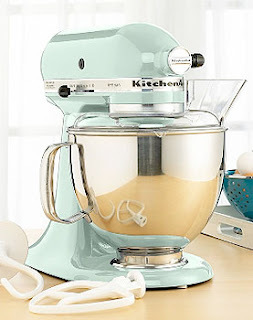 My awesome folks bought us the most awesome gift... a KitchenAid Stand Mixer in pistachio green! My mom has had a KitchenAid Mixer for forever and I have wonderful memories of using it with her while baking. I love the pistachio color. It has such a sweet vintage look to it. I will be painting the kitchen soon and plan to store the mixer out on my counter. Can't wait to see which paint colors make it pop. I've promised Ben I will christen it with chocolate chip cookies made from scratch. Now we just need a really good recipe. She's absolutely GORGEOUS!!! Congratulations! There is nothing like a Kitchen Aid in the kitchen to make a house a Home!!! My niece just sent me a CCC recipe that she loves.... I'll send it to you!